Everyone wants to gift their Beloved with something new, unusual, and unique on Valentines Day. 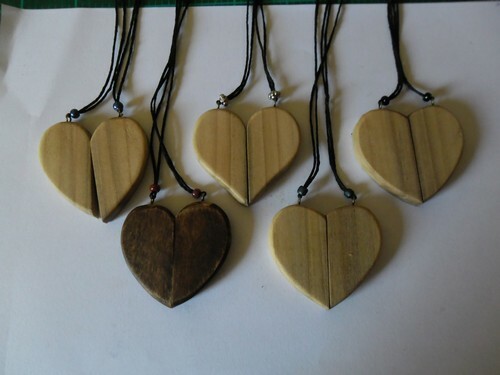 With this in mind – for our next craft market on the Sunday before Valentines Day I decided on this Valentines Day Craft project – to make a few matching Valentines heart pendants. 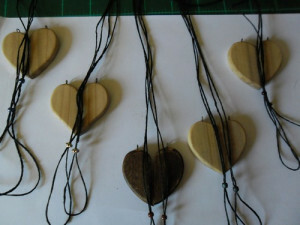 Follow along as I handcraft these Valentines Day Craft project heart pendants out of scrap I have lying around. 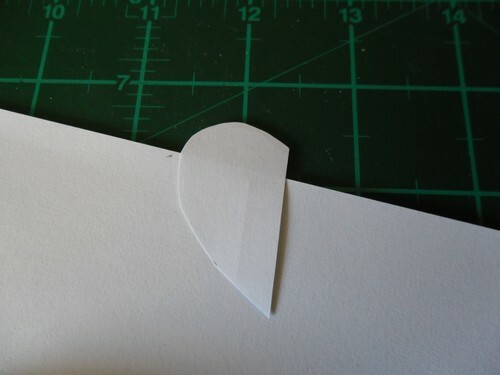 In short, I have made 10 half-hearts – to make 5 matching pairs. I am not going to provide patterns – this is pretty much a free-hand free-thinking exercise. Use wood of any thickness. Shape it as you want. Finish it off in your own way. I started with the wood. 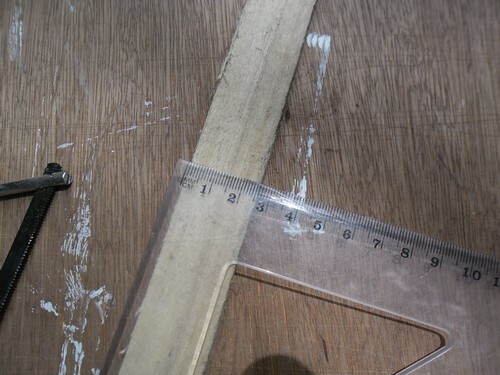 I had a piece of wood about 30mm wide, 8mm thick, and almost a metre long. 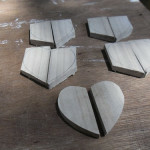 After sanding the 4 sides, I cut a paper half-heart template which I traced around onto the wood. 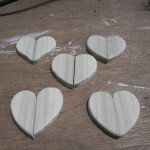 After cutting the half-heart more or less to shape with a saw I sanded the shape down to the lines. 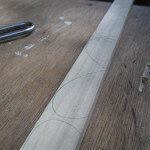 With a firmer, stronger template than a scrap of paper I now traced the shape onto the length of wood. 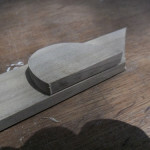 I traced the “pairs” point-to-point, to get the grain to mirror on each side. This didn’t work perfectly, but did work well enough. 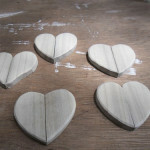 I cut each half-heart from the length of wood, then shaped each pair. If you study the photos you will see that each heart is different to the others. After the rough sanding I hand sanded each piece to take off sharp edges on the front outer edge. 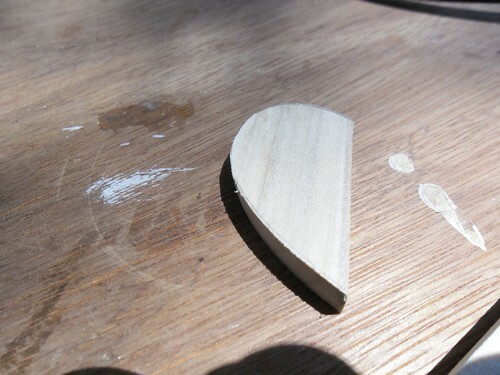 I also gave the flat surfaces – front, back, and inside face – a few strokes on the sandpaper, in the direction of the grain to remove as many sanding marks as possible. 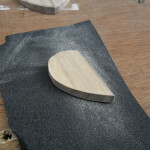 After this I used a fine sandpaper to get a really smooth finish. I now drilled 1mm holes into the top of each half-heart, inserted an eye-pin, and gave each eye-pin a drop of cyano-acrylate to secure it. 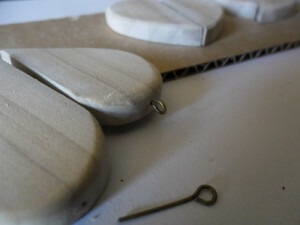 The finish on each heart pair is liquid wood wax. On one of the hearts I applied a dark brown stain, then rubbed it over with fine sandpaper to scuff it up a bit. Over the stain I applied the liquid wood wax. I did not apply any stain or wood wax to the inside faces. 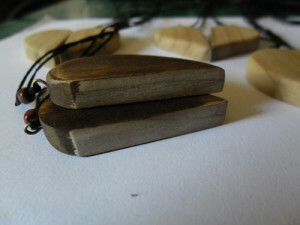 1mm Black braided cord was used to hang the pendants from. Each heart got a matching pair of beads, before I tied a single sliding knot on the cord. The inside face is there for the couple to write their names, and give a coat of clear nail varnish. Have fun – let your imagination take you where it leads!